It’s far from perfect, but the Hisense 55N6800 is proof that 4K TVs can be done well on a budget, combining great design and a well-stocked smart interface with a sharp 4K performance. It wasn’t that long ago that if you were thinking of spending under £1000 on a 4K TV, you’d probably be wasting your money. But in 2017, the best of the mid-range offers a rather tempting proposition indeed. While the more established household names have been keen to battle it out in the pricier end of the market, brands like Hisense have been making moves with more affordable sets, and TVs like the 55N6800 are the result. If you’re prepared to manage your expectations in line with its £700 price tag, the N6800 is makes a pretty compelling argument for itself, offering a taste of 4K that won’t cost a fortune. 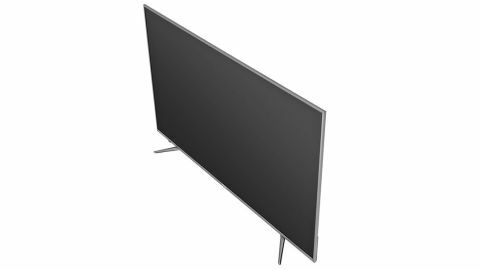 Unlike many TVs at this end of the market, the 55N6800 is solidly built, with a metal frame, skinny profile and slim bezel that gives it a smart, unassuming exterior. Its stand is made up of two feet that slot in towards the outer edges of the TV. Thankfully they’re tucked in just enough that you won’t struggle fitting it onto a standard TV stand - the feet on this 55in screen stand just over a metre apart. Connections are about par for the course at this level. There are four HDMIs, though only two are HDMI 2.0 for 4K/60fps HDR video, with the other two are HDMI 1.4 offering 4K/30fps. Elsewhere there are three USB ports, and both composite and component video inputs, with outputs including a headphone jack and an optical out for connecting a soundbar. For regular telly watching, Freeview HD and satellite tuners are built in, and there’s Wi-Fi on hand for accessing the N6800’s smart services, with ethernet available if you prefer. The remote is the only thing that lets the side down. While it’s large and easy to use, it’s pretty plasticky, so its buttons click loudly when you’re entering passwords or flicking through channels. Design TL;DR: A surprisingly sturdy and attractive designs, with a pretty comprehensive selection of inputs for its price. The N6800 continues to impress from a Smart TV perspective - the 55N6800’s VIDAA U interface has just about every catch-up service and on-demand app you could want, including BBC iPlayer, Netflix and Amazon Video (though the latter didn’t appear to have been updated to the 4K app just yet). It even includes Freeview Play as its EPG, for accessing both live TV and seven days worth of catch up programming from all the UK’s major channels. It’s a superbly stocked system for an affordable set. It’s arguably not quite as sophisticated as competing systems from Samsung or LG, but is still clear and easy to use. Press the home button on the remote and a colourful horizontal carousel will appear in the middle of the screen. This offers additional options to go to settings, media or inputs, but select the apps icon and you’ll be taken through to a full screen of apps to choose from. There’s also a store where you can install more. Of course, if it’s Netflix or YouTube you’re keen on (or Wuaki TV, even), the shortcut buttons on the remote will take you straight there with minimal faff. Smart TV TL;DR: VIDAA U might not be the most sophisticated of smart TV systems, but it has all the services you could want in a clear, easy-to-use interface. With a bit of tweaking to the out-of-the-box settings, the N6800 is capable of a very enjoyable HD picture indeed. Watching Star Wars: The Force Awakens on Blu-ray, colours look natural and well judged, outlines are sharp and there’s a good amount of detail. Black levels are impressive for an LCD TV too, although better TVs will dig out a touch more detail in the shadows. You’ll also want to be careful sitting anywhere but directly in front of it - its off-axis viewing angles are a little ropey, and you’ll notice a considerable drop in colour intensity and contrast when viewed from the side. For an edge-lit panel, the backlight uniformity is pretty good, and there wasn’t any noticeable clouding. Motion handling is also decent - despite only being a 60Hz panel, we found it didn’t really need the help of the on-board motion controls, though it did help smooth out the odd stumble when streaming from Netflix. As this will come down to taste, it’s worth playing around here to see what suits you best. The on-board upscaler does a pretty good job. Standard definition content is on the soft side but it’s watchable for when needs must, while HD content can definitely hold its own alongside the set’s native 4K picture. There’s more subtlety and detail in native 4K, but it’s not worlds apart. HD/SDR performance TL;DR: A sharp picture with lots of detail and a natural colour balance - there’s very little to grumble about the N6800’s HD performance. At this price, the 4K performance on the N6800 is fantastic, with extra depth, insight and subtlety compared to what it manages with HD. It does a great job with Netflix 4K, and colours look superb - we’d suggest the Cinema Day picture mode with colour temperature set to warm for the most accurate results. The biggest challenge for the N6800 is its brightness, which is often the biggest compromise you’ll have to make with a more affordable TV. It doesn’t come anywhere near the 1000 nits needed to get the thumbs up from the Ultra HD Alliance, instead falling somewhere between 400-500 nits. This ultimately affects how good it is with HDR. Not having that high peak brightness in its arsenal means that highlights are less impactful. And despite the fact an HDR mode kicks in automatically on detection of an HDR source (it supports HDR10 or HLG) and whacks the backlight up to max, HDR content can actually look dimmer than SDR stuff. That’s all down to tone mapping, which tries to help HDR highlights stand out by darkening the rest of the image in comparison. This can make HDR content harder to enjoy in good light, so you’ll probably want to stick to watching it at night where possible. The wider colour gamut is still noticeable though, and gives HDR content a richer, more vibrant colour palette that sets it apart from SDR. We’d just like it to have more punch behind it to make it a little more striking. 4K/HDR performance TL;DR: A strong 4K performance with even more detail up for grabs, but its lower peak brightness means its HDR talents are more limited. The answer to “should I buy a soundbar to improve my TV’s sound” is almost always a resounding yes, but the 55N6800 doesn’t sound too bad at all if you don’t have the budget for one immediately. It shows off its best in the midrange, which is clear and direct, and sounds solid with dialogue. Bass lacks the depth to show off any sort of authority for action scenes though, and while there is a volume to spare, pushing it too far can make it sound thin and harsh. It’s fine for getting by for day-to-day telly watching, then, but a soundbar will be well worth the extra investment for movies. Sound Quality TL;DR: It’s surprisingly capable, but ultimately still only good for making do - you’ll want to upgrade to a soundbar to really get the best from it. If you can push your budget up to the £1000 mark, you’re much less likely to have to compromise on things like brightness, and the Samsung MU7000 is proof of that. It produces a wonderfully bright, punchy image that can do much more justice to HDR than the N6800 does. The Philips 43PU6262, on the other hand, can get you under the £500 mark for a really very good 4K set. It’s a smaller screen, and has similar struggles with brightness, but does come with nice extra features like Ambilight built in. As for where the N6800 sits in Hisense’s range, it’s the brand’s “step up” 4K TV, and comes after the flagship NU9700 and the NU8700 in terms of ability. The Hisense N6800 is undeniably fantastic value. At £700 for a 55in screen, it’s hard to know what else you can expect from a telly at this price, with its sharp picture, well-judged colour palette and well-stocked smart system. That doesn’t mean it’s faultless. It’s biggest issue comes from its low peak brightness, which has a knock on effect on its HDR abilities. You won’t get the best HDR experience here, but its 4K (and equally strong HD) performance makes up for it. You’ll need to spend more to leapfrog this issue across the board, but for a taste of 4K at this size and price, you’ll struggle to do much better than the Hisense N6800. For our top recommendations, check out our guide to the best 4K TVs.